The Topeka Chapter on Philanthropy was founded in 1989. We have members and visitors from many Northeast and Central Kansas communities in addition to Topeka. 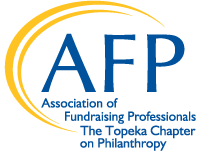 The AFP—Topeka Chapter organization meets monthly for professional development programs including webinars, discussion panels and extended length skill building sessions. In addition to regular professional development sessions, we offer special opportunities such as National Philanthropy Day in November. National Philanthropy Day is celebrated by the chapter with a well-attended program which honors fundraisers, philanthropists and nonprofit organizations. Nomination forms for awards will be mailed to AFP-TCOP members and friends in the summer. Please contact Courtney Schmelzle at afptopekachapter@gmail.com to learn more about upcoming events or register to attend. Join AFP today! AFP International offers a variety of individual and organizational memberships. AFP members may select a chapter of origin to join as well. The Topeka Chapter on Philanthropy dues are $25 annually. Click here for scholarship opportunities.